For an overview of the Investment Management Group, please download our practice group's brochure. Chapman’s Investment Management Group advises clients on a broad range of matters for registered investment companies and their independent directors, private funds and their investors, investment advisers, broker-dealers and municipal advisors. We counsel clients on formation, legal, regulatory, compliance, tax, operational, investment and transactional issues. We combine knowledge about the practical aspects of our clients’ business and industries with an understanding of the laws and regulations governing securities, funds, advisers and broker-dealers to craft workable solutions. We work diligently to educate ourselves in the constantly changing business, legal and regulatory environment faced by members of the investment management industry. We work with clients in connection with the regulatory requirements under the Investment Company Act of 1940, the Investment Advisers Act of 1940, the Securities Act of 1933, the Securities Exchange Act of 1934 and the Commodity Exchange Act. We assist clients with the registration and ongoing regulatory requirements of the Securities and Exchange Commission (SEC) and the Commodity Futures Trading Commission (CFTC) and various self-regulatory organizations including the Financial Industry Regulatory Authority (FINRA), the Municipal Securities Rulemaking Board (MSRB) and National Futures Association (NFA). Our group includes attorneys who understand the full range of legal and regulatory issues faced by the investment management industry. We work with attorneys in other areas of the firm regarding a variety of related issues including tax, general corporate matters, and the Employee Retirement Income Security Act (ERISA), banking and insurance laws, litigation and alternative dispute resolution, and bankruptcy and insolvency concerns. Our group also includes attorneys who advise clients in structuring and negotiating leverage facilities and derivatives transactions along with the corresponding regulatory and compliance issues. The Financial Industry Regulatory Authority, Inc. recently issued its 2019 Risk Monitoring and Examination Priorities Letter. The Risk Monitoring and Examination Priorities Letter also directs members to their 2017 and 2018 Reports on Examination Findings. This Client Alert provides brief summaries of some of the more significant issues FINRA’s letter raises. The beginning of each year provides an opportunity for investment advisers to review compliance and regulatory matters, including issues related to private investment funds and commodity pools. On December 14, the Securities and Exchange Commission’s Office of Compliance Inspections and Examinations issued a Risk Alert reminding investment advisers of their recordkeeping obligations with respect to electronic messaging and summarizing their related observations from recent examinations. The Securities and Exchange Commission’s Office of Compliance Inspections and Examinations has released its 2019 National Exam Program Examination Priorities. The Securities and Exchange Commission recently issued a no-action letter which allows broker-dealers to rely on investment advisers to perform some or all of their Customer Identification Program obligations under federal anti-money laundering legislation. Chapman attorney Greg Xethalis spoke at the Digital Asset Investment Forum. The Internal Revenue Service recently provided excise tax relief for funds taxed as regulated investment companies that were required to increase their gross income because of the new Section 965 transition tax. Chapman attorney Greg Xethalis spoke at the National Investment Company Service Association Crypto Economy Summit, hosted by Chapman. Chapman attorney Kathleen Moriarty spoke at the American Bar Association 2018 Business Law Section Annual Meeting. Chapman attorney Kathleen Moriarty spoke at a Quantitative Work Alliance for Applied Finance, Education, and Wisom New York Chapter event. The Securities and Exchange Commission’s Office of Compliance Inspections and Examinations issued a National Exam Program Risk Alert outlining the most common deficiencies that OCIE staff has identified in recent examinations of registered investment advisers’ best execution practices. Chapman attorney Kathleen Moriarty spoke at the 14th Annual Global ETF Awards. On June 28, the Securities and Exchange Commission proposed Rule 6c-11 under the Investment Company Act of 1940 and amendments to Form N-1A and Form N-8B-2 that overhaul the patchwork regulatory framework that currently governs the $3.4 trillion ETF industry. The Municipal Securities Rulemaking Board recently published its 2017 Compliance Advisory for Brokers, Dealers and Municipal Securities Dealers. The Compliance Advisory outlines several MSRB rules that the MSRB believes present key compliance risks for brokers, dealers and municipal securities dealers. Chapman attorney Barry Pershkow spoke at the ETFs Global Markets Roundtable. On April 18, the Securities and Exchange Commission released a new interpretation addressing investment advisers’ fiduciary duties to their clients. The SEC’s proposed interpretive guidance reaffirms and clarifies duties owed by investment advisers to their clients under Section 206 of the Investment Advisers Act of 1940. On April 18, the Securities and Exchange Commission proposed new Regulation Best Interest under the Securities Exchange Act of 1934 that would establish a federal standard of conduct for broker-dealers and natural persons who are associated persons of a broker-dealer when making a recommendation of any securities transaction or investment strategy involving securities to a retail customer. The Securities and Exchange Commission recently proposed new and amended rules and forms under the Investment Advisers Act of 1940 and the Securities Exchange Act of 1934 to require registered investment advisers and broker-dealers to provide a brief relationship summary to retail investors regarding their offered services, the standard of conduct and fees associated with the services. Today, the Securities and Exchange Commission voted 4 to 1 to propose highly anticipated new and amended rules and guidance relating to registered investment advisers’ and broker-dealers’ conduct and interactions with retail customers. The Securities and Exchange Commission’s Office of Compliance Inspections and Examinations recently published a Risk Alert that highlights frequently-identified investment adviser fee and expense compliance issues from exams of over 1,500 investment adviser examinations during the past two years. 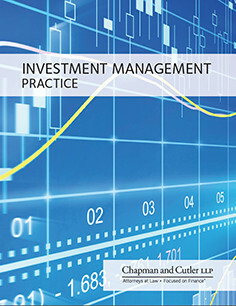 Chapman sponsored the Investment Company Institute's Mutual Funds and Investment Management Conference. The Securities and Exchange Commission’s Office of Compliance Inspections and Examinations recently released its 2018 National Exam Program Examination Priorities. Highlights from the 2018 exam priorities are reviewed in this Client Alert. Chapman attorney Kathleen Moriarty spoke at the Yahoo Finance All Markets Summit. The beginning of each year provides an opportunity for investment advisers to review compliance and regulatory matters, including issues related to private investment funds and commodity pools, which are briefly summarized in this alert. Chapman attorney Barry Pershkow spoke at the Inside ETFs Conference. The Financial Industry Regulatory Authority, Inc. recently issued its 2018 Regulatory and Examination Priorities Letter. A number of FINRA’s comments direct firms to review the 2017 Examination Findings Report for additional insights into specific areas of concern and effective practices. Chapman attorney Kathleen Moriarty was featured on an episode of Bloomberg's ETF IQ to discuss bitcoin and the fund life cycle. On August 11, the IRS issued Rev. Proc. 2017-45 which allows publicly offered real estate investment trusts and regulated investment companies to make stock distributions that will qualify for the dividends-paid deduction, if certain requirements are met, and therefore enable a RIC or REIT to meet its minimum annual dividend distribution tests. Both the House and Senate versions of the Tax Cuts and Jobs Act include a new provision that would impose an excise tax on the compensation paid by certain exempt organizations, including certain state and local governmental entities, if the compensation to a covered employee is more than $1 million. On November 2, Representative Brady released the proposed text of the long-awaited federal income tax reform bill. The bill also includes a provision that appears aimed at subjecting public pension plans to unrelated business taxable income. The staff of the Securities and Exchange Commission issued three no-action letters designed to assist broker‑dealers and investment advisers in addressing issues related to European Union directives and related legislation that will become effective on January 3, 2018. The Financial Industry Regulatory Authority, Inc. released additional guidance on social media and digital communications in Regulatory Notice 17-18. The guidance from FINRA is summarized in this article. The Securities and Exchange Commission’s Office of Compliance Inspections and Examinations recently published a Risk Alert that highlights frequently identified investment adviser advertising compliance issues. The Risk Alert identifies the advertising compliance issues most frequently identified in deficiency letters from investment adviser examinations. The Department of Labor published its proposal to delay for 18‑months the more onerous provisions of the exemptions that were issued in connection with the DOL’s fiduciary rule. The exemptions were supposed to be fully effective January 1, 2018. Instead, the DOL has proposed that they become fully effective July 1, 2019. The Department of Labor recently issued another set of FAQs, focusing on advisors to 401(k) plans. The FAQs generally address two issues. In a court filing on August 9, the Department of Labor notified the court that it recently submitted proposed amendments to the three exemptions to its fiduciary rule to the Office of Management and Budget. In February 2017, the staff of the Securities and Exchange Commission’s Division of Investment Management issued guidance providing additional clarity on Rule 206(4)-2 under the Investment Advisers Act of 1940. Effective May 14, 2018, amendments to Municipal Securities Rulemaking Board Rule G-15 and Financial Industry Regulatory Authority Rule 2232 will subject firms to new transaction-related disclosure requirements to retail investors for certain fixed income securities. The Securities and Exchange Commission announced that it is requesting comments from retail investors and other interested parties on the standards of conduct applicable for broker-dealers and investment advisers. Labor Secretary Alexander Acosta confirmed in an Op-Ed in the Wall Street Journal that the Department of Labor fiduciary rule will become applicable on June 9. Along with the Op-Ed, the DOL issued new Conflict of Interest FAQs related to the June 9, 2017 to January 1, 2018 transition period and Field Assistance Bulletin No. 2017-2. The Financial Industry Regulatory Authority, Inc. recently released additional guidance on social media and digital communications. FINRA previously issued guidance on the use of social media communications in Regulatory Notice 10-06 and Regulatory Notice 11-39. On May 1, Tax Notes published a flurry of revocations of private letter rulings that had been issued to regulated investment companies. In each of the revocations, at least one of the rulings requested in the original private letter ruling was that the income from a commodity linked note was qualified income for the purposes of Internal Revenue Code § 851. The Municipal Securities Rulemaking Board recently withdrew a proposed rule from consideration by the Securities and Exchange Commission. The rule would have prohibited a broker, dealer or municipal securities dealer from effecting a customer transaction in municipal securities in an amount lower than the minimum denomination of the issue stated in offering documents. The Financial Industry Regulatory Authority, Inc. recently released three Regulatory Notices related to its ongoing review of its members’ involvement in the capital formation process. The Financial Industry Regulatory Authority, Inc. recently requested comments on proposed amendments to FINRA Rule 2241 (on equity research) and FINRA Rule 2242 (on debt research) that would create a safe harbor for trading desk commentary distributed to eligible institutional investors subject certain conditions. Yesterday the Department of Labor released the final rule delaying the applicability of the DOL fiduciary rule and the related prohibited transaction exemptions to June 9, 2017. The rule was originally set to become applicable on April 10, 2017. The Department of Labor announced a proposed 60-day delay of the applicability date of the DOL fiduciary rule and related exemptions. The DOL has allowed a 15-day comment period providing all interested parties an opportunity to comment on the proposed delay. The staff of the Securities and Exchange Commission’s Division of Investment Management recently issued new guidance providing additional clarity on Rule 206(4)-2 under the Investment Advisers Act of 1940. The Financial Industry Regulatory Authority, Inc. announced the effective date of amendments to FINRA Rule 2232 requiring firms to disclose additional transaction-related information for certain fixed income securities principal transactions with retail customers. The Municipal Securities Rulemaking Board is requesting comments on proposed amendments to its advertising rule for brokers, dealers, and municipal securities dealers and a new advertising rule for municipal advisors. The Financial Industry Regulatory Authority, Inc. recently proposed amendments that would create a new exception to FINRA’s prohibition on projecting performance. The proposed exception to FINRA Rule 2210 would permit a firm to distribute a customized hypothetical investment planning illustration. The Securities and Exchange Commission’s Office of Compliance Inspections and Examinations recently published a Risk Alert listing five compliance topics most frequently identified in deficiency letters to investment advisers following exams. The Securities and Exchange Commission is seeking comments on proposed new Municipal Securities Rulemaking Board Rule G-49 prohibiting a broker, dealer or municipal securities dealer from effecting a customer transaction in municipal securities in an amount lower than the minimum denomination of the issue stated in offering documents. President Trump issued a memorandum directing the Department of Labor to conduct an analysis of the fiduciary rule’s potential impact. Depending on the results of its examination, the memorandum instructs the DOL to publish for notice and comment a proposed rule to rescind or revise the rule. The Securities and Exchange Commission’s Office of Compliance Inspections and Examinations recently released its Examinations Priorities for 2017. The beginning of each year provides an opportunity for investment advisers to review annual compliance and regulatory matters, including issues related to private investment funds and commodity pools. This alert briefly summarizes some of the primary issues that advisers might consider in their 2017 annual review and update processes. The Financial Industry Regulatory Authority, Inc. recently issued its annual Regulatory Examination Priorities Letter. This alert summarizes some of the more significant issues FINRA’s letter raises. The staff of the Securities and Exchange Commission’s Division of Investment Management has released guidance focused on disclosure issues and certain procedural requirements associated with mutual funds implementing intermediary‑specific variations to sales loads and adding new share classes. The Municipal Securities Rulemaking Board recently published guidance on broker-dealer obligations when executing transactions involving a registered investment adviser that is authorized to exercise full discretion to buy and sell municipal securities on behalf on an account holder. The Municipal Securities Rulemaking Board recently issued an interpretive notice announcing its interpretation that if a dealer engages in a transaction with a customer in a municipal security that bears market discount, the dealer must disclose the existence of market discount to its customer as part of the “time of trade disclosure” required under MSRB Rule G-47. The Securities and Exchange Commission recently approved Financial Industry Regulatory Authority, Inc. and Municipal Securities Rulemaking Board rule amendments requiring broker-dealers to disclose trade compensation for certain fixed income securities principal transactions with retail customers. The Financial Industry Regulatory Authority, Inc. recently filed proposed rule changes with the Securities and Exchange Commission to amend FINRA Rule 4512 and adopt FINRA Rule 2165. The Securities and Exchange Commission recently approved proposed rule changes by the Financial Industry Regulatory Authority, Inc. that would revise certain filing requirements of FINRA Rules 2210, 2213 and 2214. The Municipal Securities Rulemaking Board recently issued a notice seeking guidance on its strategic priorities for 2017. The MSRB’s notice seeks comment on potential areas where the MSRB should focus its strategic goals and how it should prioritize its core activities. On October 27, the Department of Labor issued its first wave of FAQs to address certain questions that have arisen with respect to the DOL’s previously issued fiduciary rule. Generally, the Rule broadly defines who is a fiduciary under the Employee Retirement Income Security Act and the Internal Revenue Code. The Financial Industry Regulatory Authority announced that it is conducting a sweep examination on broker-dealer firms to look into incentives and business practices that may encourage employees to engage in inappropriate cross-selling activities. The Securities and Exchange Commission voted last Thursday to adopt changes to enhance liquidity risk management by open-end funds, including mutual funds and exchange-traded funds. Last week, the IRS contemporaneously released two pieces of guidance related to the question of whether qualifying regulated investment company income could include indirect commodities income through controlled foreign corporations or derivative exposure to commodities. The Municipal Securities Rulemaking Board recently published its 2016 Compliance Advisory for Brokers, Dealers and Municipal Securities Dealers. The Compliance Advisory outlines several MSRB rules that the MSRB believes present key compliance risks for brokers, dealers and municipal securities dealers. After several years of securities industry efforts, the Securities and Exchange Commission has formally proposed a rule change that would shorten the standard settlement cycle for most broker-dealer securities transactions from three business days after the trade date to two business days after the trade date. Municipal Securities Rulemaking Board Rule G-15(f) prohibits a broker, dealer or municipal securities dealer from effecting a customer transaction in municipal securities in an amount lower than the minimum denomination of the issue stated in offering documents, subject to two current exceptions. The Securities and Exchange Commission is seeking comments on proposed Municipal Securities Rulemaking Board rule changes that would require dealers to disclose bond mark-ups and mark-downs on retail customer trade confirmations. On August 25, after approximately five years of litigation concluding with a 25-day bench trial, Judge Peter G. Sheridan issued the opinion of the U.S. District Court for the District of New Jersey in the first trial of a “manager-of-managers” theory of liability for breach of fiduciary duty. The Securities and Exchange Commission recently approved new Financial Industry Regulatory Authority, Inc. pay‑to-play rules to regulate activities of FINRA member firms that engage in distribution or solicitation activities with government entities on behalf of investment advisers. The Securities and Exchange Commission recently adopted changes to certain aspects of the reporting, disclosure and recordkeeping obligations of registered investment advisers including changes to Form ADV. The Financial Industry Regulatory Authority, Inc. recently proposed amendments to its gifts, non-cash compensation and business entertainment rules. The Securities and Exchange Commission is seeking comments on proposed Financial Industry Regulatory Authority, Inc. rule changes that would require members to disclose bond mark-ups and mark-downs on retail customer trade confirmations. The Internal Revenue Service issued Notice 2016-10 to address foreign tax credits and regulated investment companies. The Internal Revenue Code does not provide guidance on the question of how a RIC should treat refunds of foreign tax when it has made an election to pass the foreign tax credit to its shareholders. Notice 2016-10 begins to address this question. Following the implementation of Dodd-Frank's rules and regulations and the initial wave of SEC examinations of municipal advisors, management and compliance personnel are navigating through the rules while continuing to run their business and service clients. The Securities and Exchange Commission’s Office of Compliance Inspections and Examinations recently issued a Risk Alert announcing that they will be undertaking an examination initiative focused on the risk that registered advisers may be making conflicted recommendations to their clients. The Securities and Exchange Commission recently proposed a new rule and rule amendments under the Investment Advisers Act of 1940 that would require SEC-registered investment advisers to adopt and implement written business continuity and transition plans. The Financial Industry Regulatory Authority, Inc. recently filed changes to new FINRA Rule 2242 (Debt Research Analysts and Debt Research Reports) with the Securities and Exchange Commission. The rule is still new and FINRA has delayed implementation several times. The Financial Industry Regulatory Authority, Inc. recently filed proposed changes to certain aspects of the FINRA rules governing member firms’ communications with the public. The proposed rule changes are substantially similar to those proposed by FINRA in May 2015. The Securities and Exchange Commission recently published a notice of its intention to adjust for inflation dollar amount thresholds for the “qualified client” definition under Investment Advisers Act of 1940 Rule 205-3. Under Rule 205-3, an investment adviser may charge performance-based fees to a “qualified client” meeting a minimum net worth or minimum assets. The Financial Crimes Enforcement Network recently published its final rule under the Bank Secrecy Act of 1970, as amended on customer due diligence requirements for banks, broker-dealers, mutual funds and futures commission merchants and introducing brokers in commodities. The Financial Industry Regulatory Authority, Inc. delayed the implementation of FINRA Rule 2242 until July 16, 2016. FINRA Rule 2242 addresses conflicts of interest relating to the publication and distribution of debt research reports. The Municipal Securities Rulemaking Board prohibits a broker, dealer or municipal securities dealer from effecting a customer transaction in municipal securities in an amount lower than the minimum denomination. The MSRB recently proposed adding two additional exceptions that would allow dealers to sell below stated minimums. This alert addresses several frequently asked questions related to sales of unit investment trusts registered under the Investment Company Act of 1940 by those persons deemed fiduciaries under the U.S. Department of Labor's recently released fiduciary rule. Today the U.S. Department of Labor released its highly anticipated final rule to define the term “fiduciary” and address conflicts of interest in providing investment advice to retirement accounts. The staff of the Securities and Exchange Commission’s Division of Investment Management recently released guidance regarding registered investment company risk disclosure. The Municipal Securities Rulemaking Board is seeking comment on proposed guidance on establishing the “prevailing market price” and calculating mark-ups and mark-downs for principal transactions in municipal securities. The Financial Industry Regulatory Authority, Inc. delayed the implementation of FINRA Rule 2242 (Debt Research Analysts and Debt Research Reports) until April 22, 2016. FINRA Rule 2242 addresses conflicts of interest relating to the publication and distribution of debt research reports. This Client Alert briefly summarizes some of the primary issues that advisers might consider in their 2016 annual review and update processes. The Securities and Exchange Commission recently approved amendments to Financial Industry Regulatory Authority, Inc. rules to apply FINRA Rule 2121 (Fair Prices and Commissions) to government securities. On January 6, 2016, the staff of the Securities and Exchange Commission’s Division of Investment Management released guidance regarding registered open-end investment company payments to certain financial intermediaries that provide shareholder and recordkeeping services for investors. The staff’s guidance is designed to help fund boards oversee and evaluate whether sub-accounting fees are for distribution or non-distribution services. In December 2014, the Securities and Exchange Commission approved a new Municipal Securities Rulemaking Board best execution rule for transactions in municipal securities and related amendments applicable to “sophisticated municipal market professionals." In September, the IRS issued final regulations to clarify that controlled groups under the rules for regulated investment companies may consist of only two entities. This may cause unanticipated attributions of ownership, which would disqualify some RICs from beneficial tax treatment. The Municipal Securities Rulemaking Board recently adopted amendments to MSRB Rule G-20 on gifts, gratuities and non-cash compensation. The rule changes become effective on May 6, 2016. The Municipal Securities Rulemaking Board recently proposed amendments to MSRB Rules G-12 and G-15 that would shorten the settlement cycle from T+3 (trade date plus three business days) to T+2 (trade date plus two business days) for transactions in municipal securities. The Financial Industry Regulatory Authority, Inc. recently filed a proposed rule change with the Securities and Exchange Commission to apply FINRA rules on bond mark-ups and commissions to transactions in exempted securities that are government securities. The Securities and Exchange Commission recently proposed new rules and amendments designed to enhance liquidity risk management requirements for certain open-end management investment companies, including mutual funds and exchange-traded funds. The Municipal Securities Rulemaking Board recently proposed amendments to MSRB Rule G-15 that would require brokers, dealers and municipal securities dealers to disclose the mark-up or mark-down on retail customer confirmations for specified principal transactions. The Financial Industry Regulatory Authority, Inc. recently issued a Regulatory Notice providing guidance on liquidity risk management practices that FINRA expects member firms to consider and implement in preparation for adverse circumstances. The Securities and Exchange Commission’s Office of Compliance Inspections and Examinations recently issued a Risk Alert providing information on the areas of focus for the SEC staff’s second round of cybersecurity examinations of registered investment advisers and broker-dealers. The National Futures Association recently submitted an interpretive notice proposal to the Commodity Futures Trading Commission that would require NFA members to establish information systems security programs. The Financial Crimes Enforcement Network recently proposed rulemaking to prescribe minimum standards for anti-money laundering programs. The Financial Industry Regulatory Authority, Inc. recently announced the adoption of amendments to its equity research rules and entirely new rules governing debt research. The Securities and Exchange Commission’s Office of Compliance Inspections and Examinations recently issued a Risk Alert summarizing deficiencies in controls of certain broker-dealers related to sales of structured products to retail investors. The Securities and Exchange Commission is seeking comments on proposed rule changes by the Financial Industry Regulatory Authority, Inc. addressing external personal accounts opened or established by associated persons of FINRA member firms. The Financial Industry Regulatory Authority recently issued a Regulatory Notice to remind firms that their written supervisory procedures should identify the process for detecting, resolving, and preventing the consequences of short positions and fails-to-receive in municipal securities. The Securities and Exchange Commission recently published orders approving two rule proposals by the Financial Industry Regulatory Authority, Inc. governing equity and debt research analysts and research reports. The Securities and Exchange Commission is seeking comments on a proposed rule change by the Financial Industry Regulatory Authority, Inc. that would amend FINRA Rule 2210 (Communications with the Public). Law360 republished a Chapman Client Alert. The Securities and Exchange Commission recently set the compliance date for the ban on certain payments to third-party solicitors under Rule 206(4)-5 of the Investment Advisers Act of 1940 as July 31, 2015. The staff of the Securities and Exchange Commission’s Division of Investment Management recently published guidance on investment adviser Code of Ethics exceptions to personal securities transaction reporting for securities transactions occurring in certain types of trusts or investment management accounts where the beneficiary or account holder has limited or no discretionary investment authority. The Financial Industry Regulatory Authority is requesting comment on a revised proposal to adopt a new FINRA rule that would consolidate and clarify former National Association of Securities Dealers and New York Stock Exchange rules regarding discretionary accounts and transactions. On June 12, 2015, the Securities and Exchange Commission issued a release seeking public comment to help inform its review of the listing and trading of new, novel, or complex exchange-traded products. The Financial Industry Regulatory Authority recently issued a Regulatory Notice announcing that it had added additional guidance to the FINRA Rule 2210 questions and answers webpage to provide additional guidance on advertising and other communications with retail investors. The Securities Industry and Financial Markets Association recently proposed that the Financial Industry Regulatory Authority amend its rules to replace the current broker-dealer “suitability” standard with a new “best interests” standard along with enhanced customer disclosure about a broker-dealer’s services, conflicts of interest, fees, and compensation. The Financial Industry Regulatory Authority recently released a Regulatory Notice in which it proposed changes to certain aspects of the FINRA rules governing member firms’ communications with the public. This Client Alert is a summary of the proposed changes. This Client Alert summarizes the Securities and Exchange Commission proposed changes to certain aspects of the reporting, disclosure, and recordkeeping obligations of registered investment advisers. This Client Alert summarizes the Securities and Exchange Commission proposed changes to certain aspects of the disclosure and reporting obligations of registered investment companies. The Financial Industry Regulatory Authority recently issued an interpretive letter that allows distributors of mutual funds to include related performance information in communications with institutional investors, including registered broker-dealers and investment advisers. On May 20, 2015, the Securities and Exchange Commission proposed changes to certain aspects of reporting and disclosure obligations of registered investment advisers and investment companies. The staff of the Securities and Exchange Commission’s Division of Investment Management recently published guidance for registered investment advisers and registered investment companies related to cybersecurity preparedness in their business practices. The Securities and Exchange Commission staff recently announced an initiative to conduct examinations of registered investment company complexes that have not previously been examined. The staff of the Securities and Exchange Commission recently issued guidance to remind affiliates of registered investment companies that the receipt of gifts or entertainment may violate Section 17(e)(1) of the Investment Company Act of 1940. The Securities and Exchange Commission’s Office of Compliance Inspections and Examinations recently issued its 2015 Regulatory and Examinations Priorities Letter. The Financial Industry Regulatory Authority, Inc. recently issued its Regulatory and Examinations Priorities Letter. In this alert are brief summaries of some of the more significant issues FINRA’s letter raises. The Securities and Exchange Commission recently issued a no-action letter which grants relief to broker-dealers, allowing them to rely on investment advisers to perform some or all of their Customer Identification Program obligations under federal anti-money laundering legislation. The beginning of each year provides an opportunity for investment advisers to review annual compliance and regulatory matters, including issues related to private investment funds and commodity pools. The Securities and Exchange Commission approved the Municipal Securities Rulemaking Board’s proposal to implement a “best execution” standard for municipal securities transactions. The Securities and Exchange Commission is seeking comments on two new rule proposals by the Financial Industry Regulatory Authority, Inc. governing equity and debt research analysts and research reports. The Financial Industry Regulatory Authority, Inc. recently proposed new “pay-to-play” rules that would regulate the activities of FINRA member firms engaging in distribution or solicitation activities with government entities on behalf of investment advisers. The Financial Industry Regulatory Authority, Inc. and the Municipal Securities Rulemaking Board recently requested comment on proposals to require disclosure of pricing information on customer trade confirmations for certain fixed income security transactions. The Municipal Securities Rulemaking Board recently announced the approval of an amended continuing education rule that will require annual training and expand the coverage of its Firm Element. The Board of Governors of the Financial Industry Regulatory Authority, Inc. recently authorized regulatory notices seeking comment on initiatives to enhance transparency and execution quality in fixed income markets. The staff of the Commodity Futures Trading Commission recently issued relief for certain exempt commodity pool operators that permits general solicitation and general advertising in connection with offerings of commodity pools. The Securities and Exchange Commission is seeking comments on the first ever explicit “best execution” rule for municipal securities transactions proposed by the Municipal Securities Rulemaking Board. On August 18, 2014, the Municipal Securities Rulemaking Board released for public comment draft amendments the Proposed Amendments) to existing Rule G-37, which restricts “pay to play” practices by regulating certain activities by brokers, dealers and municipal securities dealers. The Municipal Securities Rulemaking Board recently announced its intent to move forward with several actions aimed at enhancing price transparency for municipal securities. The Municipal Securities Rulemaking Board has released for public comment a revised draft of its proposed Rule G-42 on the duties of municipal advisors. On May 19, 2014, the Staff of the Office of Municipal Securities of the Securities and Exchange Commission issued additional guidance on the SEC’s registration rules for municipal advisors. The Municipal Securities Rulemaking Board recently announced the approval and effectiveness of its new fair-pricing rule. Amended MSRB Rule G-30 consolidates dealer fair-pricing obligations into a single rule on prices and commissions for principal and agency transactions in municipal securities. The Financial Industry Regulatory Authority, Inc. recently filed proposed advertising rule changes with the Securities and Exchange Commission.